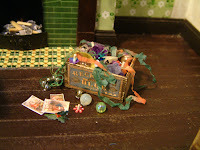 Well....as 2012 draws to an end, KT Miniatures is now well and truly closed for the festive season. However.....I had a final pre-Christmas flash of creative activity and completely indulged myself in making some family presents. 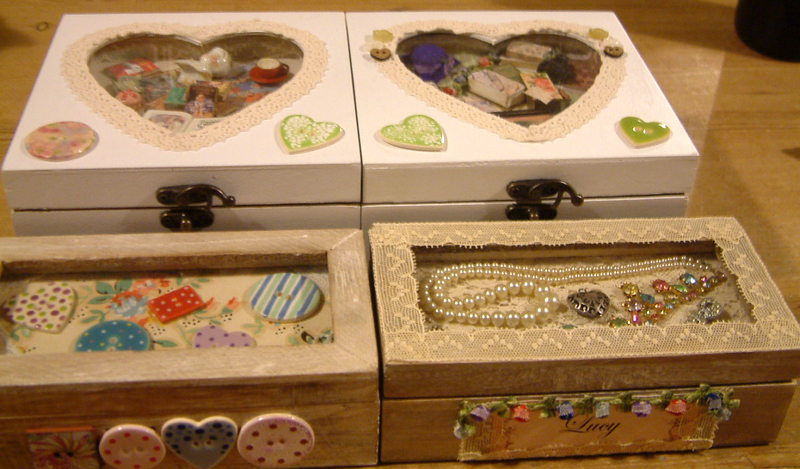 To briefly explain....whilst mooching in a charity shop the other day I came across a couple of wooden chests that had glazed lids decorated with random "sewing bits". A bit naff but a flash of inspiration hit me and I felt confident that with some tweaking these would make ideal Christmas presents. 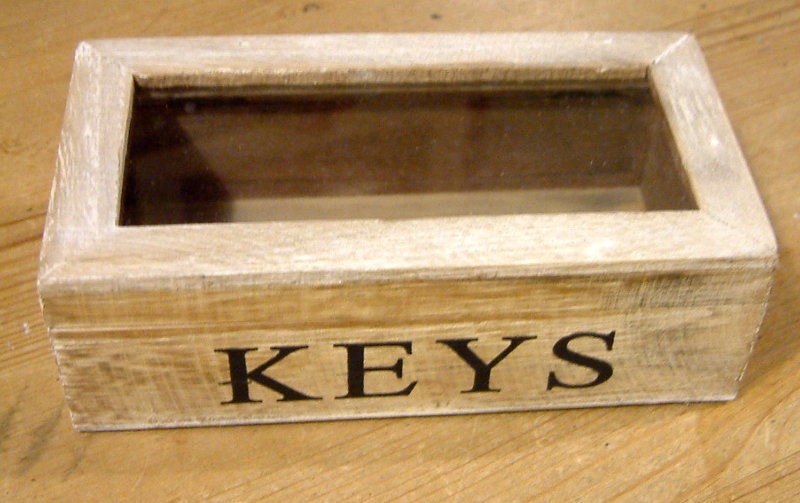 I also came across a couple more little boxes, greatly reduced in price in a well known high street store....unfortunately one had the word "Keys" and the other "Coins" embossed on the front. But again I felt confident that I could do something with them....and I picked them up for a a snip. And this was the result!! 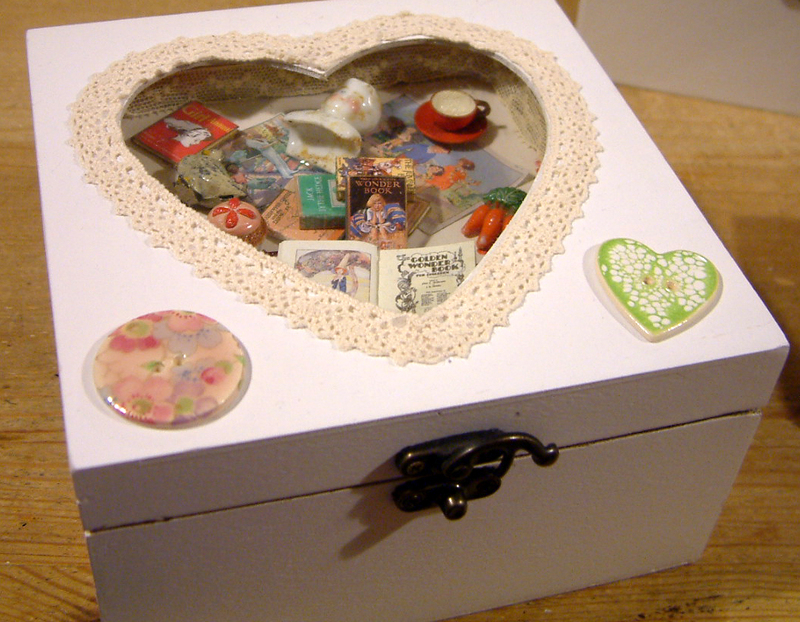 This has been filled with some of my handmade books, a Victorian doll's head, vintage plaster food, a vintage lead duck, vintage wooden teacup and saucer plus some scaled down replicas of '30s school posters. This was filled with one of my biblical prints, chocolate box filled with WW1 letters, cards etc, a felt hat, a Victorian doll's head, some 1930s lead Britains flowers, a lucky Victorian black cat, some of my handmade books plus a vintage silk garland. 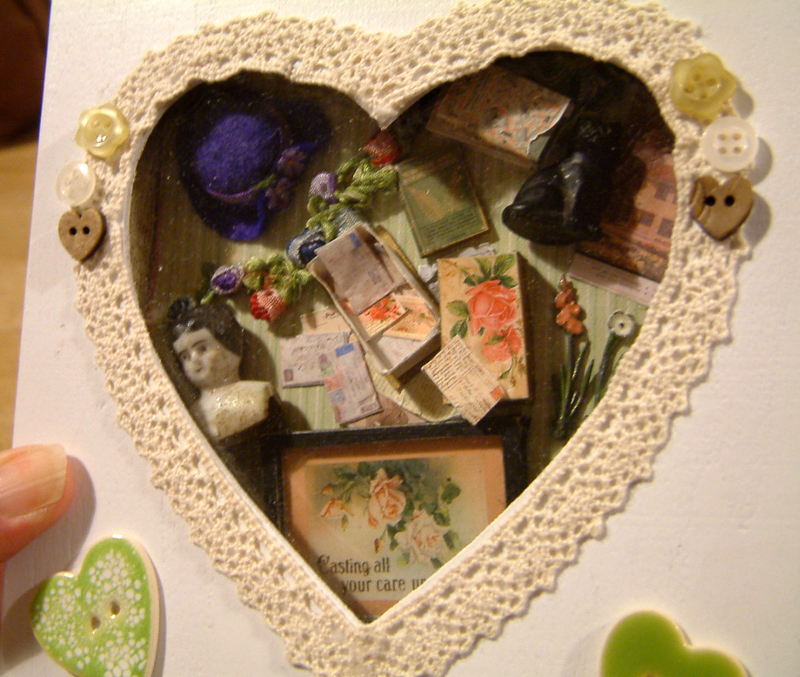 Both of these had a heart shaped window glazed with real glass....so I simply chiselled out the wooden backing, removed the sewing bits and pieces, lined the backing with antique wallpaper then filled with a mixture of some of my handmade miniatures and antique/vintage pieces. 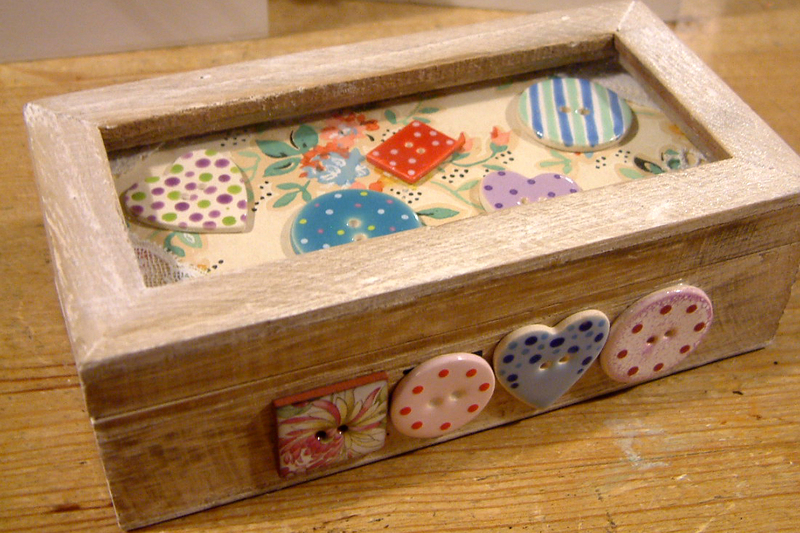 The exterior was embellished with china buttons as well as ordinary buttons. 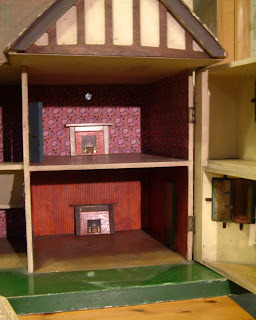 The exteriors have been lined with antique wallpaper and lace. 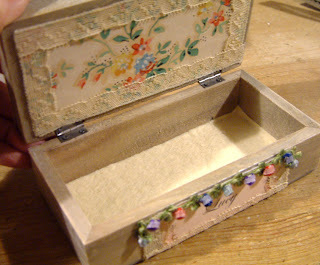 This smaller box is destined for a niece. 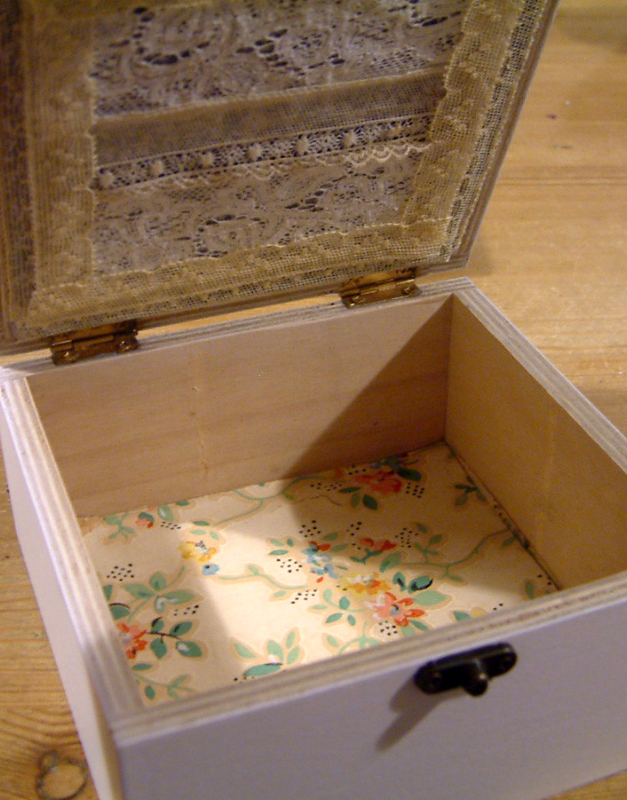 It was given a thick cardboard backing, covered in lace then filled with broken bits of her grandmother and great grandmother's jewellery. The lid was edged with antique lace and inside covered in a mixture of antique wallpaper, felt and lace. The wording at the front was disguised by a printed card with the soon to be recipient's name and adorned with vintage silk garland and more lace.....total indulgence! This one has also been given a cardboard backing covered in some of my antique wallpaper and simply filled with china buttons plus a tiny bit of antique lace. 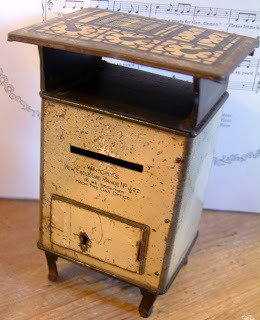 The embossed wording on the front was cunningly covered with buttons! 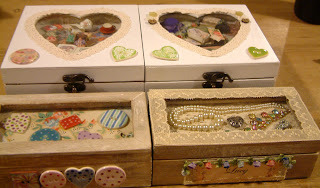 I had great fun "playing" with these and hope that the recipients like them too!!! "Xmas is a season of joy. Children hang up their stockings and have jolly parties." I hope you all have a joyous Xmas and lots of jolly parties!!! A VERY MERRY CHRISTMAS & HAPPY NEW YEAR FROM KT MINIATURES! I will be opening again on January 3rd (not the 2nd as originally planned). 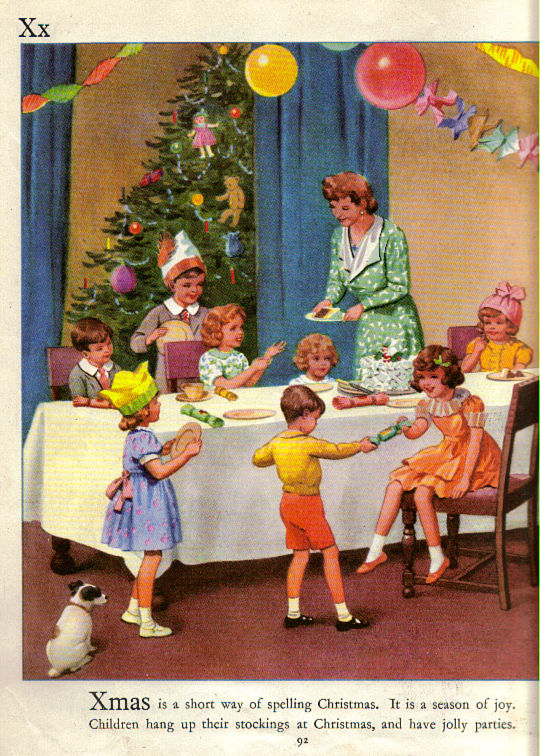 Have a brilliant time everyone. 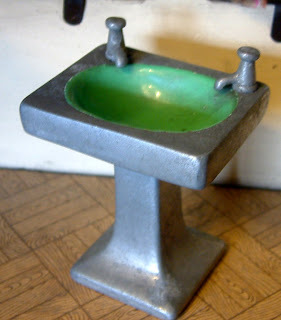 Still Time To Order From KT Miniatures! For UK customers there is still just time to sneak that last minute order in for Christmas delivery. However I strongly recommend Special Delivery now in order to guarantee it getting to you for the big day! I do have some lovely old dolls houses available so there is still time to order and collect from me here in Thame, Oxfordshire (close to the M40). 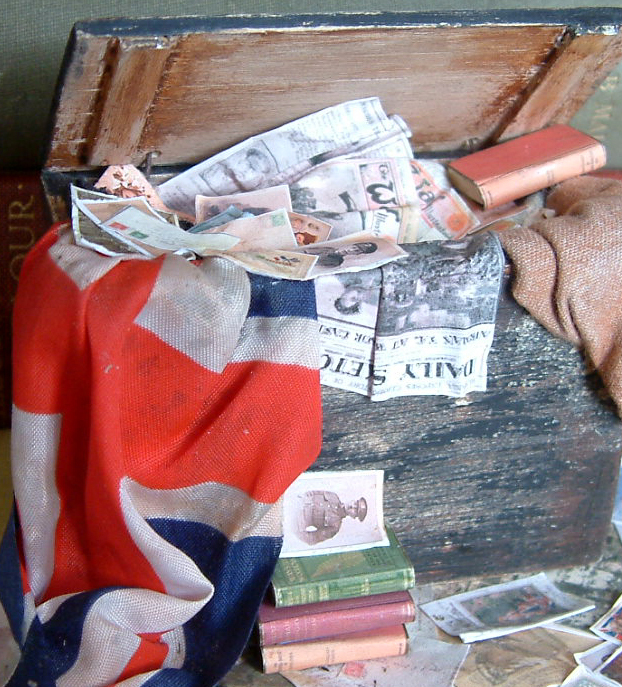 However please ring or email first to check availability and arrange a mutually agreed time. 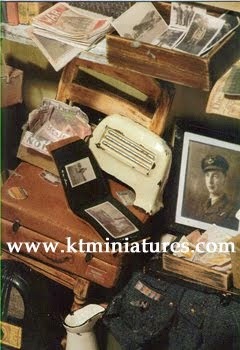 THIS IS JUST A REMINDER THAT KT MINIATURES WILL BE CLOSING ON WEDNESDAY 19th DECEMBER AND OPENING AGAIN ON JANUARY 2nd 2013. PS. 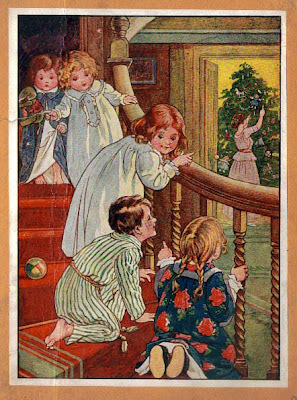 The gorgeous image immediately above is part of a vintage educational teaching card. 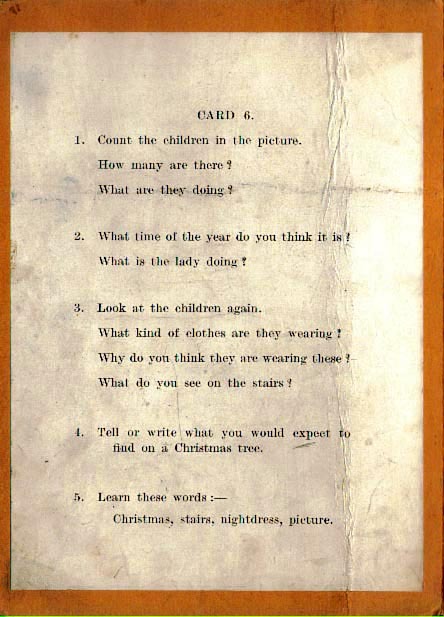 To keep the children amused....why not get them to answer the questions!!! You will have to click on the image below to enlarge in order to read the writing...unless you have bionic eyesight!!!!! 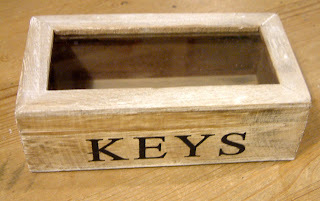 A Bit Of Lateral Thinking....And Some Rather Lovely Miniatures! 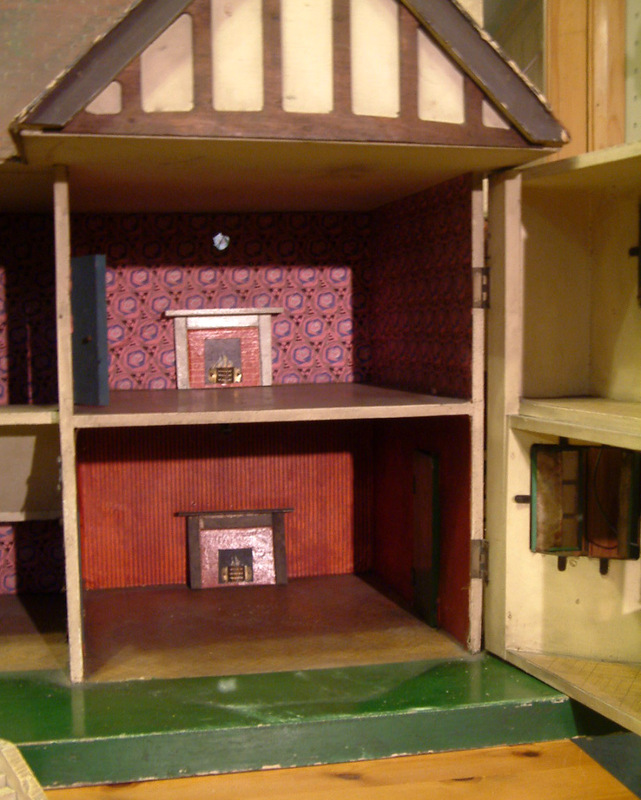 Being a miniaturist, it helps to think laterally at times. 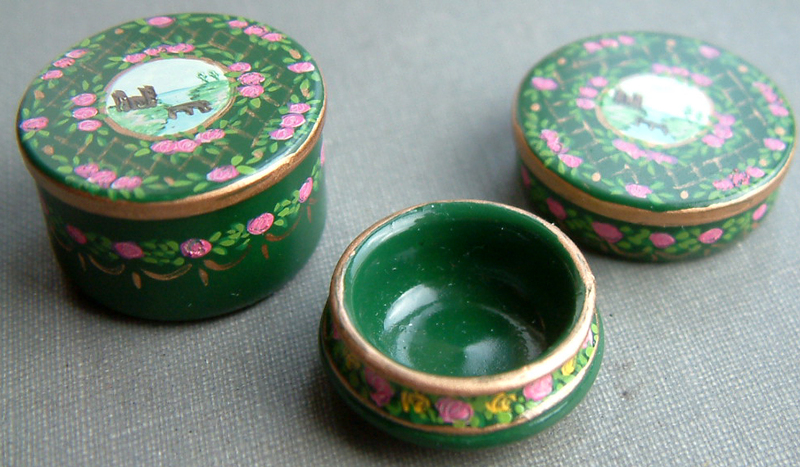 I have just listed today, some mini treasures that were not originally created specifically for dolls houses.....but could be put to good use in our little miniature abodes. There is this wonderful early 1900s Eagle Gas Range by J. Wright & Co. of Birmingham, England....and is in fact a tin money box....probably created as an advertising gimmick to promote their real life sizes Eagle Gas Ranges. 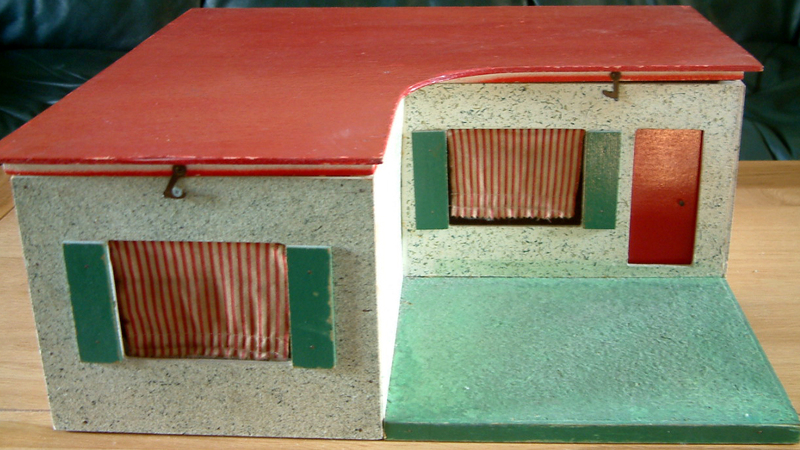 The front oven door is moulded and non opening, for effect only. Around the back is a tiny little door that opens so that you can retrieve your money from inside.....the money slot being above, as you can see in the photo. 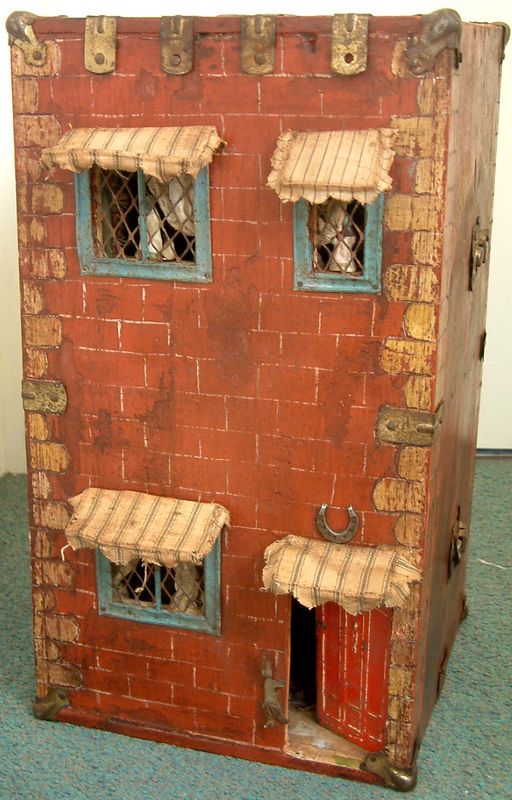 Ok....it maybe rather large and not fit your ordinary common and garden antique dolls house.....but if you have one of those delightful quirky large dolls houses with extremely high ceilings and where scale really does not matter.....this could be perfect for you. 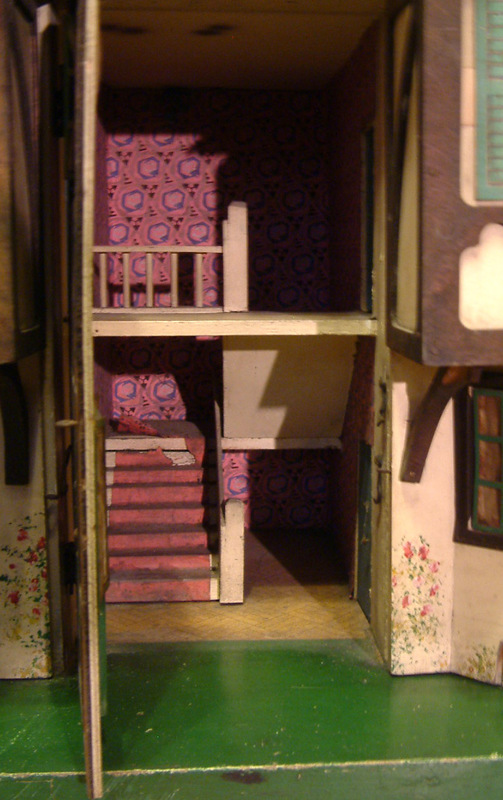 Alternatively, you could simply create a quirky large scale room box in an old crate or similar....and collect some of the wonderfully oversized miniatures that not many people can fit into their average scale dolls house? 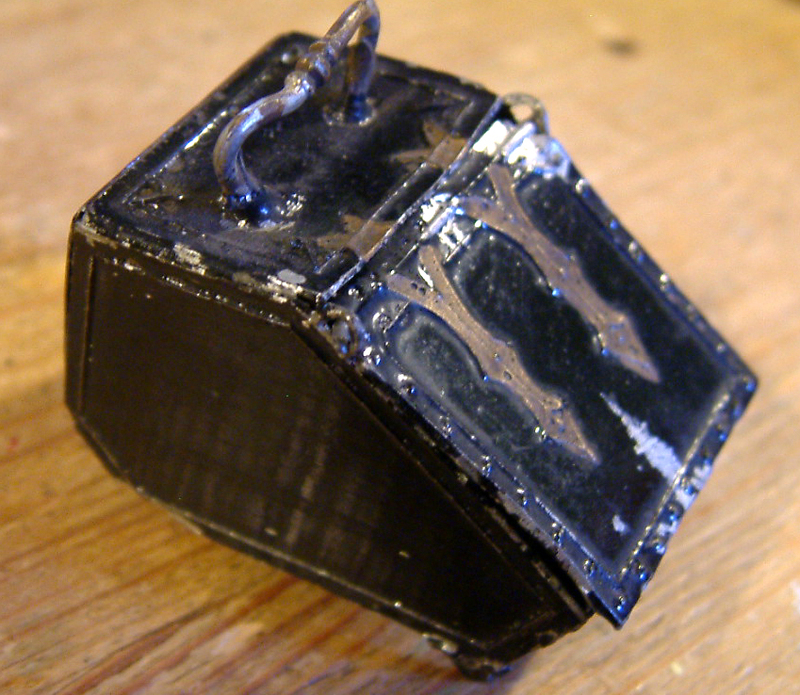 To give you an idea of scale, this actually measures 5 1/4" high x 3 1/2" wide x 3 3/8" deep. 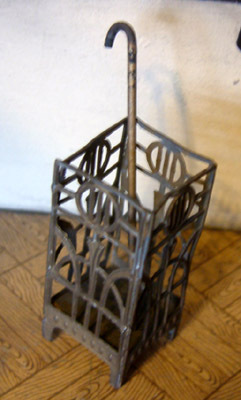 This can be found on the Antique 1/10th & Larger Scale Page. 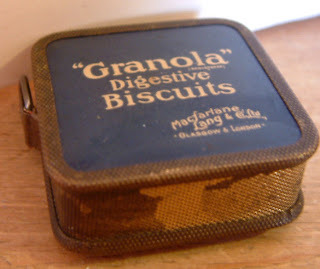 Then there is this...at first glance may look simply like a vintage miniature box of Granola Digestive Biscuits. 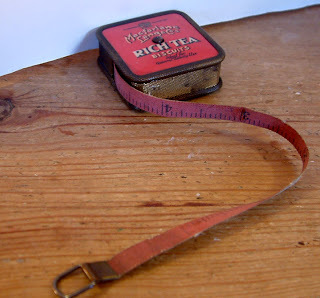 If you turn it over it looks like a tin of Rich Tea Biscuits....however on close inspection you will see a loop at the side....pull that and you will discover that this is in fact a tape measure that pulls right out. When you have finished with it, you simply press the little central button and the tape springs back in. Again, like the cooker, this was probably an advertising gimmick- this time by Macfarlane Lang & Co Ltd, in order to promote their biscuits. It is absolutely exquisite. 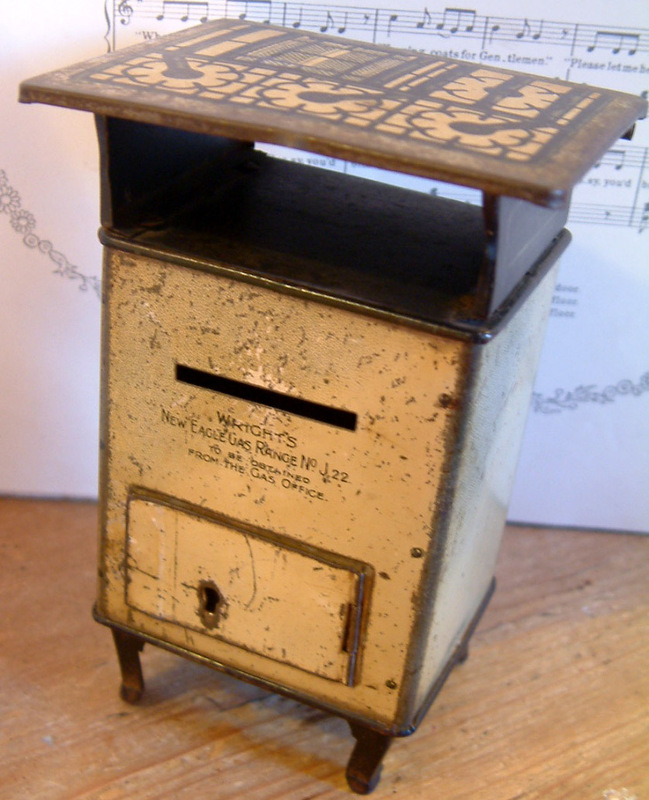 And finally.......here is another money box...this time a safe. 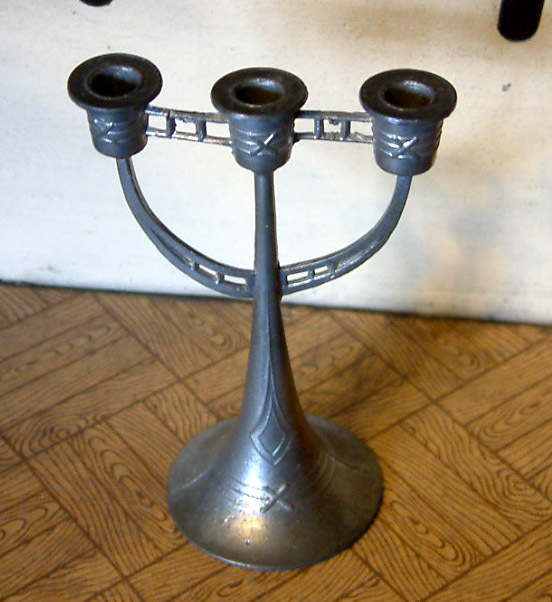 It is made from cast iron and is incredibly heavy. 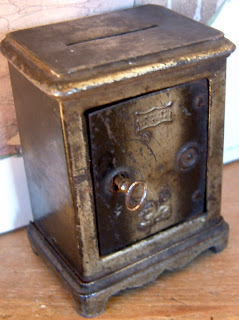 The door still has the original key so can be locked and unlocked with ease for you to retrieve your pennies! 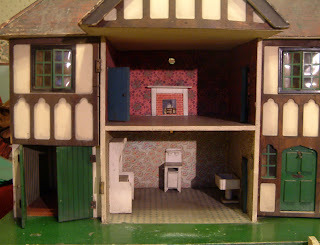 However, in an antique dolls house, this could look amazing.....maybe in a library, drawing room or even attic room. Let your imagination run wild! Age is unknown but could be early 1900s, certainly very old. 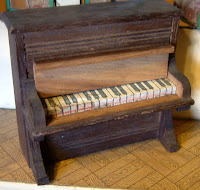 Also maker is unknown....there was some sort of writing on the front but is illegible. 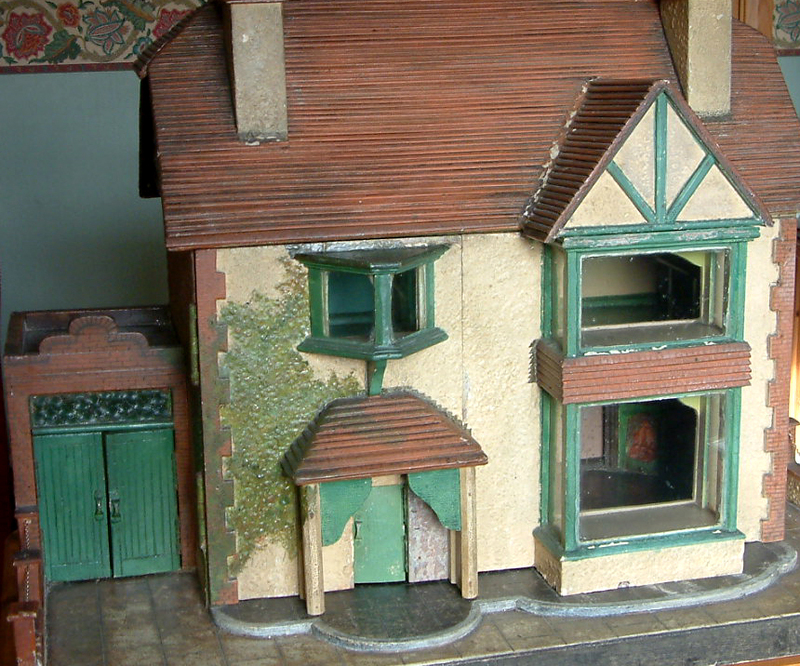 With Christmas nearly upon us, it is probably apt to give you advance warning that KT Miniatures will be closing it's creaky doors at midday on Wednesday 19th December for the festive holidays. I will be opening again on Wednesday 2nd January 2013. There is still plenty of time to order your mini treasures for Christmas though.........I have lots , both handmade and antique/vintage including several dolls houses. 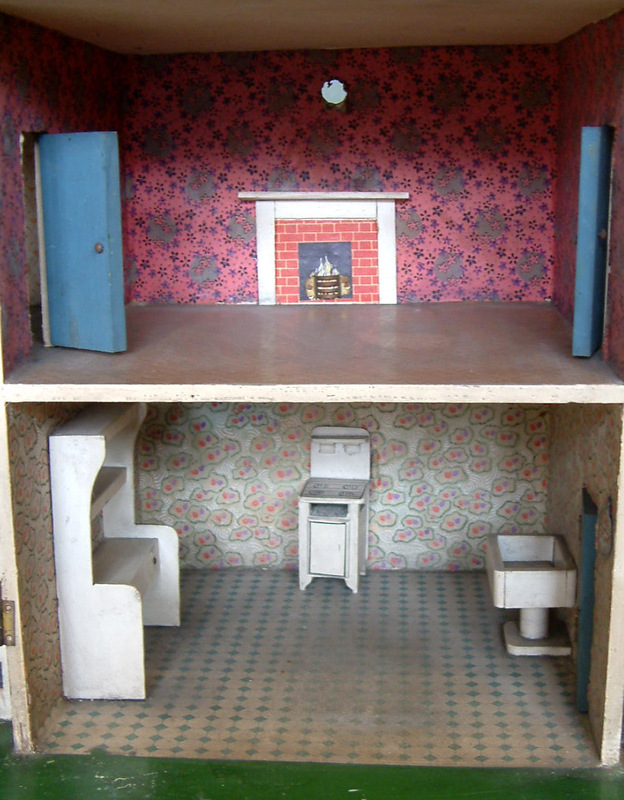 Plus of course there are Marion Osborne's rather wonderful reference books on Tri-ang and Dol-Toi, for the serious dolls house collectors.....exclusively now only available from KT Miniatures! 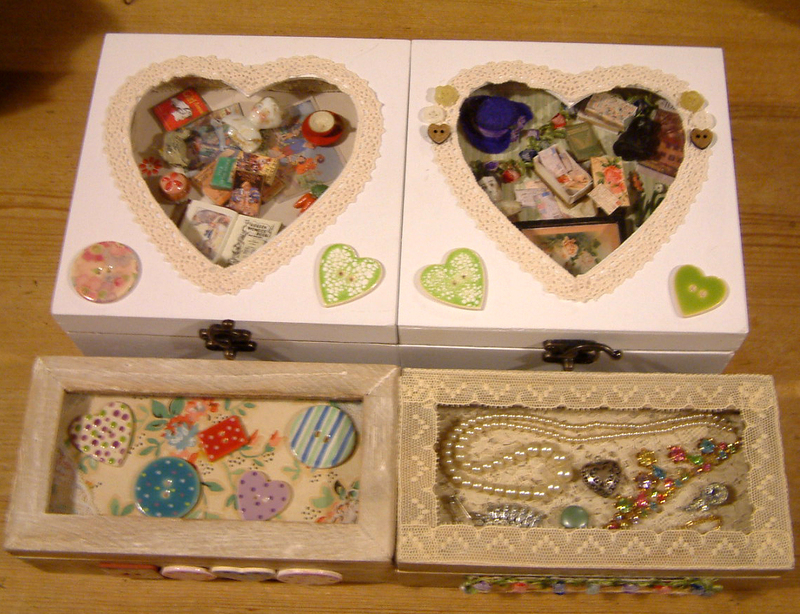 All would make rather lovely Christmas presents either for yourself or for someone special. 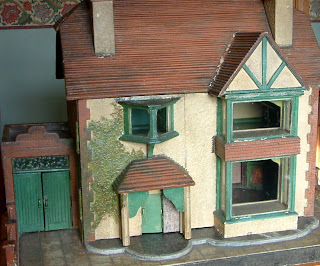 However, pleeeeaaase remember that if you are asking Father Christmas for any items from KT Miniatures, please do remember to give him the correct reference and description, as stated on the website listings. This little Santa's Helper would hate to send the wrong item! All Kinds Of Everything - Yet More Miniature Delights. 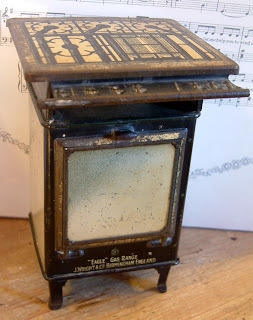 Over the past few days I have been listing a variety of wonderful little treasures, some already sold but lots are still available. Normally I am closed for business on a Sunday but for the next three Sundays in December, in the run up to Christmas, I should be around if you need to contact me by phone or email. I have highlighted some of the little miniature delights below! 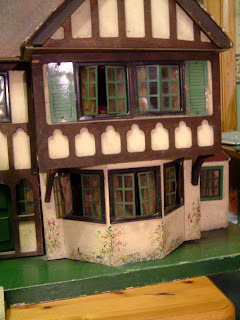 I know this is much bigger than the average size dolls house cutlery set....more like dolls size (cutlery measures 2 1/4" long), but it could suit a dolls house of a larger scale or an old house where scale does not matter. 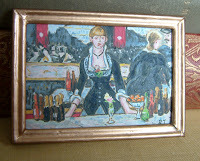 This was made by A.S. Cartwright Ltd of Birmingham, UK who brought out a new range under the label of "Gwenda" in 1936. 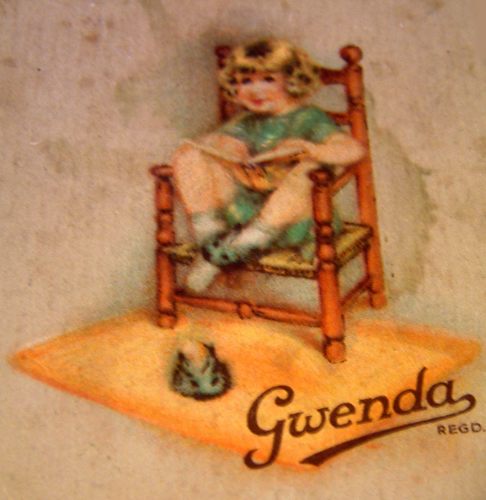 All their boxed packaging from then on contained this recognisable image of a little girl sitting on a chair reading a book...isn't it fabulous?! Incedently both his wife and eldest daughter were called Gwenda. 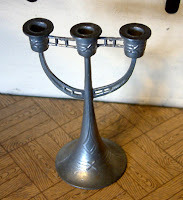 These rather lovely 1930s items are now available on the Antique 1/12th Living & Dining Room Page. Even though they have been placed under the Antique 1/12th section, scale is all over the place, particularly with the German candelabra...but will suit an old dolls house where scale does not matter. This incredibly heavy metal sink and large china toilet are now available on the Antique 1/12th Bathroom Page. 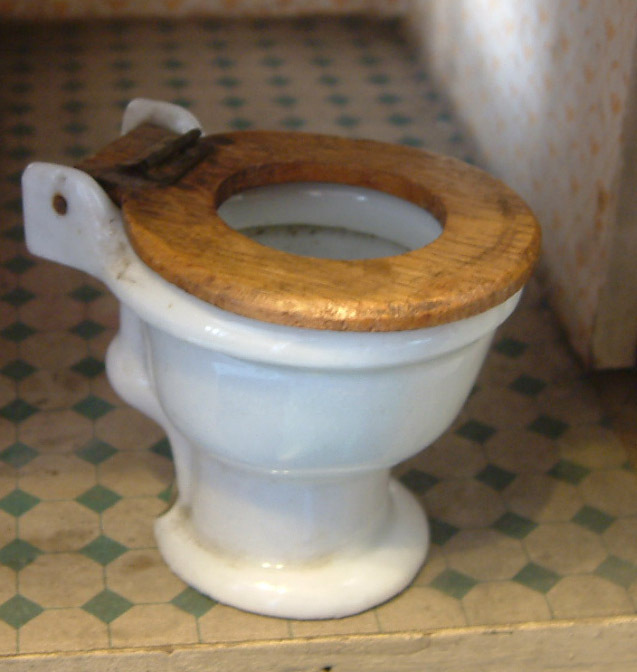 Although the toilet has lost it's lift up lid, the seat still remains and it is quite different from the usual smaller china toilets that are more commonly found. 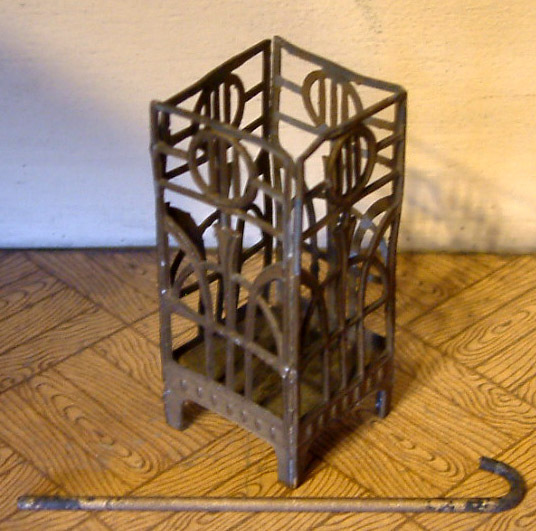 And finally....there is this quite rare and intriguing soft metal German umbrella stand plus walking stick. This is gorgeous, even though it has lost much of it's matt painted finish, the intricate metal fretwork is still all there....lovely item. 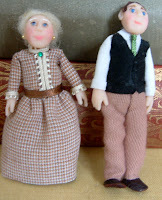 It is also unusual to have a walking stick too. I hope to do more listing today so do keep checking the website. Please remember to refresh each page in order to view updates. IT'S THAT TIME OF YEAR AGAIN....THE RAFFLE PAGE IS NOW LIVE! 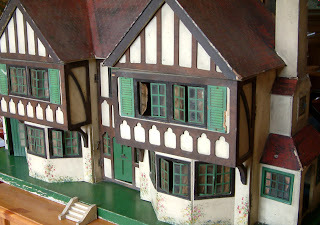 The Thame Dolls House & Miniatures Fair on Saturday February 23rd 2013. Once again I am delighted to be co-ordinating this raffle as each year this proves to be a popular attraction at Thame Fair. Everyone's generosity never ceases to amaze me....from the artisan donators to the public buying tickets. There are currently four donations to kick this off.....and as the donations emerge, I will list them on the promotional page in the order that they come in. 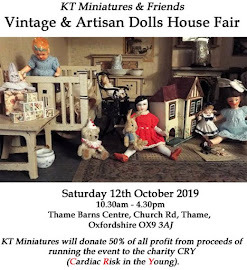 Please note that the tickets can only be purchased at Thame Fair so hopefully we can tempt your mini tastebuds and entice you along to the Thame Dolls House Fair next February? 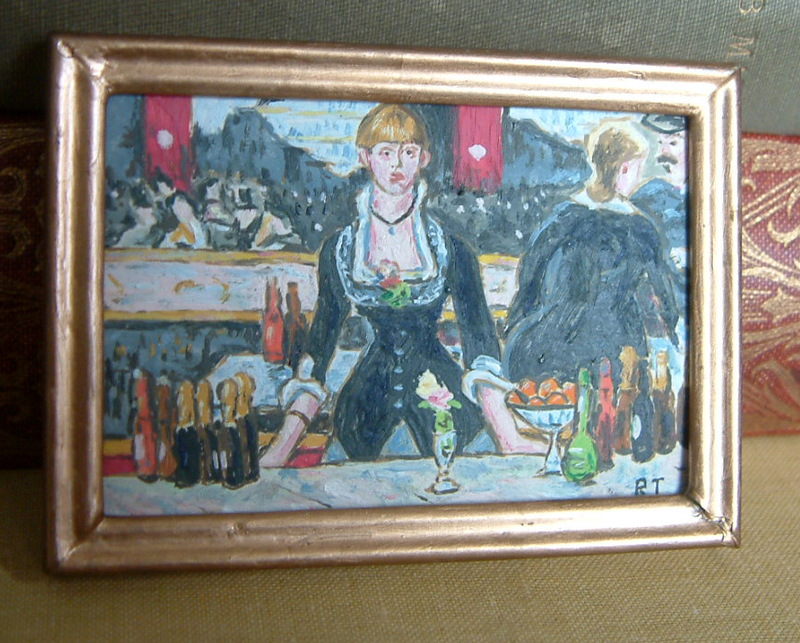 The raffle prizes, as always, will be from professional miniaturist artisans and traders only. So if there is anyone out there reading this who fits this category, no matter where in the world you are.... and would like to make a special donation, please do send them to me, Celia Thomas here at KT Miniatures. My contact details are on my website: www.ktminiatures.com. On the day, many of the rather lovely stand holders usually donate some magnificent prizes too so we often have well in excess of 30-40 prizes (and over 30 -40 winners).....so its worth coming to this very special and magical Oxfordshire event for that reason alone!!! The Thame Town Crier....will be conducting proceedings as usual. 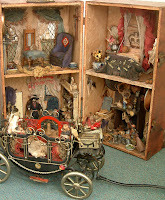 KT Miniatures will have a double stand at this event and its the only regular fair that I attend nowadays. So do please make a note in you diary of Saturday 23rd February 2013. It will be taking place at the Thame Leisure Centre in Thame, Oxfordshire. The M40 is very close, plus there is a regular bus that stops right outside direcly from Oxford Station plus Haddenham & Thame Parkway Station. Not only are there 46 high quality artisan stand holders but there are various fundraising attractions too, all in aid of Breast Cancer Campaign, including the infamous Sales Table! This charity funds research into breast cancer and has great personal significance as I have lost both my mother and maternal grandmother to this disease. Sadly I am sure there are many of you reading this whose family and friends have also been touched by this awful disease, either directly or indirectly. So why not come along to this wonderful event and help us raise lots for the worthwhile charity and have an enjoyable miniature day out too! Labels: Breast Cancer Campaign Raffle, Thame Dolls House And Miniatures Fair. A Rather Lovely c1930s Tri-ang Stockbroker! A gorgeous circa 1936-38 Tri-ang Stockbroker dolls house has been put up for sale this afternoon, amazingly in original condition.....including all the wallpaper, flooring, fireplaces, bath, cooker, kitchen sink and dresser plus of course, all the windows! 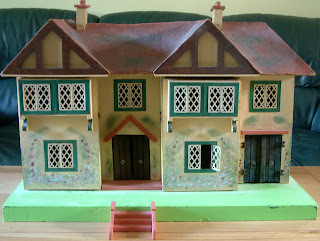 Also......it has the elusive second chimney and set of steps...which are often missing. 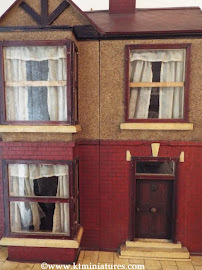 As the second chimney and steps were supplied loose they were easily mislaid over time...so consequently there are a lot of Stockbroker dolls houses out there missing these! I have promised the previous owner that this will go to a good home, which I have no doubt it will as this really is one for the serious collector. She told me this wonderful story on how when she was a baby, back in 1965, her builder father set off to an auction with the intention of buying two ladders for his work. 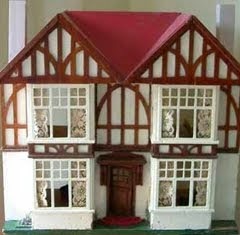 However, he returned from the auction with this dolls house instead! Haha....fathers eh! Anyone who knows about Tri-angs...will know that this particular model is big and you need a lot of space to fit it in. 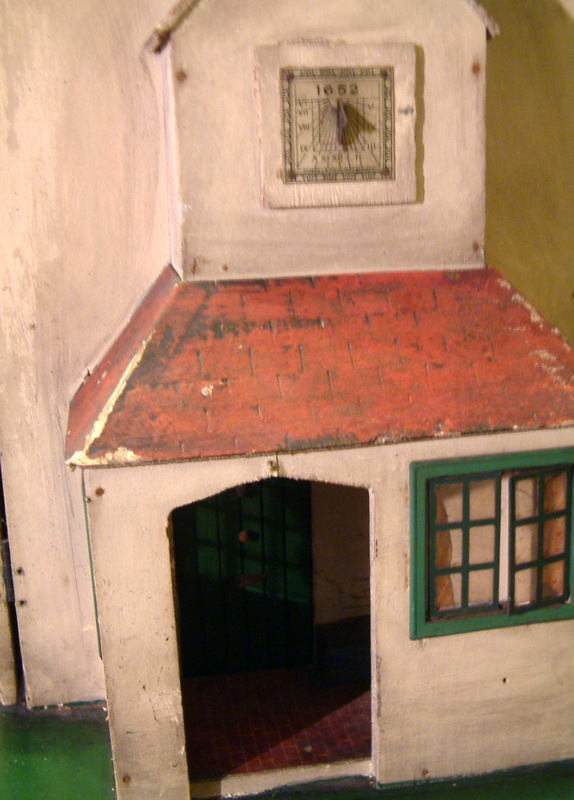 It measures just under 47 ½” wide x 17 ¼” deep x 24” high (when the loose chimney is perched on – it measures approx 26” high). The original papers are lovely....and as you can see in the kitchen,there is that infamous amoeba patterned wallpaper and blue/white tiled flooring. 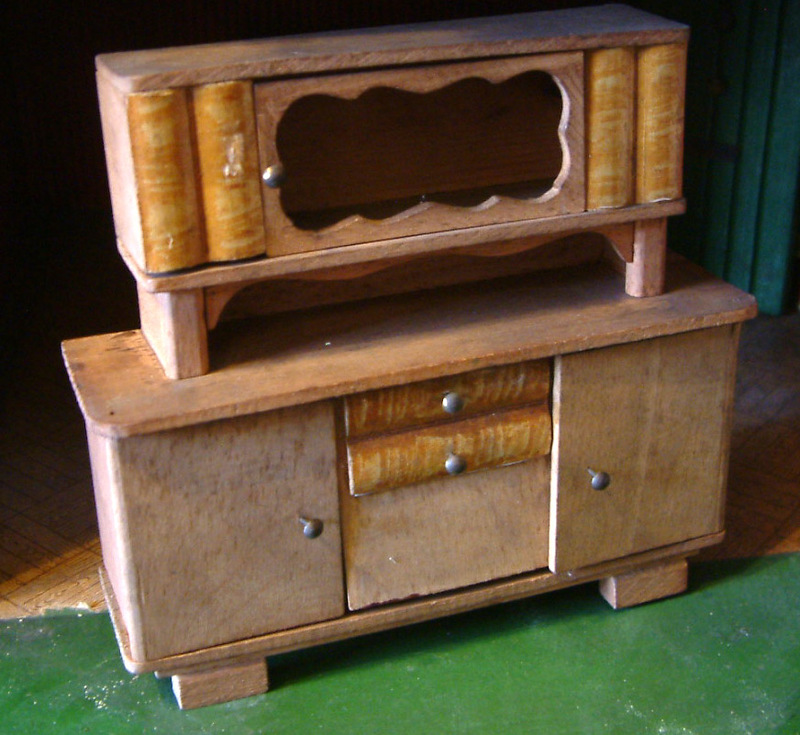 Is great to have the original wooden kitchen furniture of a dresser, gas cooker and sink. 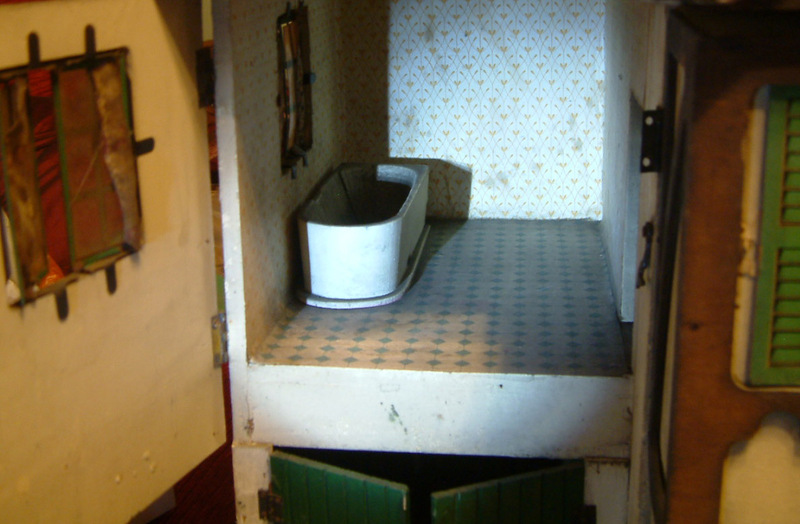 We know that the gas cooker replaced the wooden range in the Stockbroker models around 1936-1937....so that helps us with the dating of this dolls house.The hinges have come away from the main carcas on the left frontage......but should not be too difficult to rehang. Plus this particular bathroom wallpaper design was believed to be in existence until about 1938/39....so this is how I arrived at the dating of this house. As you can see, the bath is still in place too......it is so pleasing to have these original features still intact! 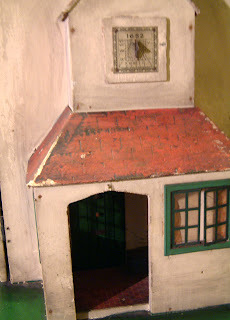 The front door with its metal letterbox, knocker and handle opens to reveal the hall, carpeted stairs and landing. 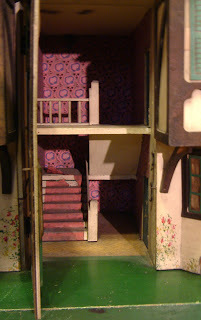 Again, you can see the original flooring and wallpaper, plus the landing has a strip of ballustrade. The right frontage opens to reveal the living room and second bedroom, both with the fireplaces, flooring and wallpapers. The papers are glorious, still vibrantly rich in colour. There is a door leading into the side porch. 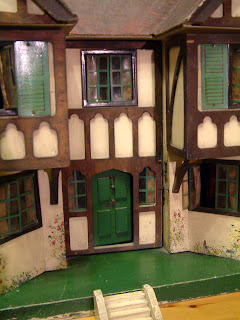 Then there is this side porch........I absolutely adore this feature. I think probably because it stems back from my childhood and we had a kind of back porch on our old 1930s lodge house....but nothing as grand as this. There is a little blue bench tucked inside the porch and as you can see, the side door with a full set of door furniture ie. knocker, letterbox and handle. Another lovely feature is the sundial above the porch, on the chimney stack.The dial bit is metal and the rest is a printed card image......very attractive. This dolls house is now available to purchase with a 10% Special Christmas Discount....as are all my other antique and vintage dolls houses currently for sale on KT Miniatures. This Special Offer lasts until the 3rd December. It is certainly going to be a real fun project to do. Rumour has it there will be mulled wine, mince pies and even choccies in constant supply! Should be a good day. So to all the ladies that are coming.....see you there, bright and early at 10.00! 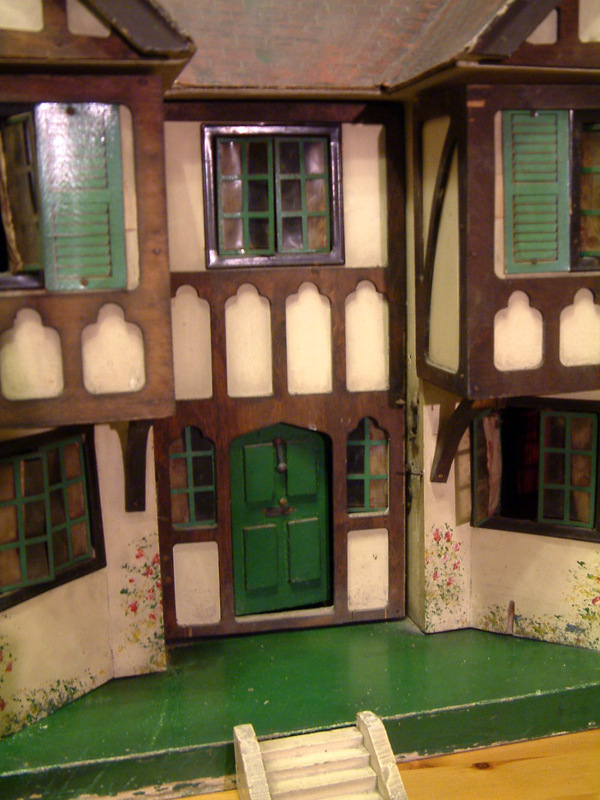 Special Christmas Discount Offer Off All Antique & Vintage Dolls Houses! 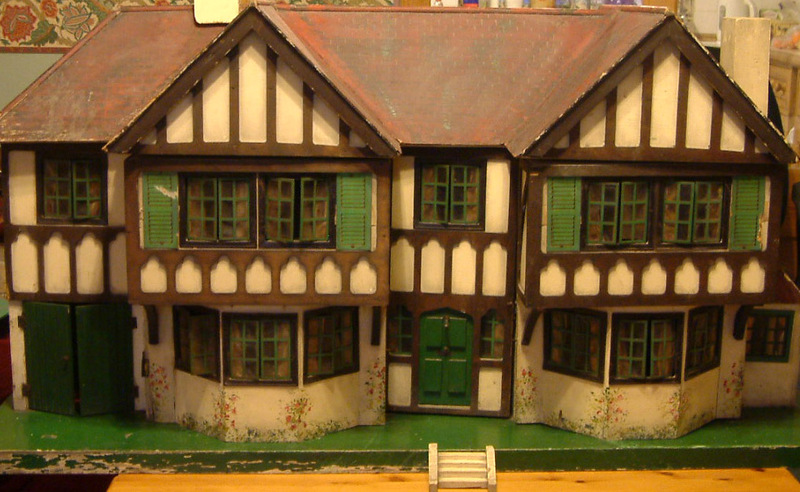 In honour of the impending festive season, I am delighted to offer KT Miniatures customers a HUGE 10% discount off marked prices on all vintage dolls houses currently for sale on KT Miniatures. So why not treat someone special this Christmas.....or you could even ask Father Christmas yourself! 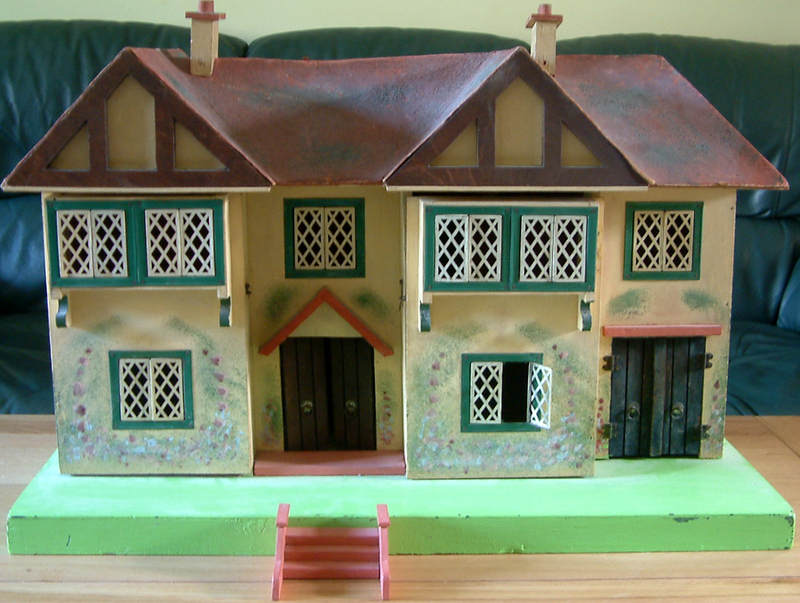 A vintage dolls house is an ideal Christmas present for any vintage dolls house collector. This offer lasts for 14 days only and conditions apply - offer ends Monday 3rd December 2012 at 4.00pm GMT. CLICK HERE TO VIEW FULL DETAILS OF SPECIAL OFFER INCLUDING TERMS & CONDITIONS.